Led Zeppelin All the Songs: The Story Behind Every Track by Jean Michel Guesdon & Philippe Margotin tells the story of every Led Zeppelin recording, from the Bron-Yr-Aur cottage where much of Led Zeppelin III was recorded to Headley Grange, the stage for Andy Johns' famous recording of John Bonham at the foot of a stairwell. The mammoth, 608-page hardback examines the genesis and recording of every Led Zeppelin song in detail: the following edited excerpt tells the story of 1971's Going To California. Led Zeppelin All the Songs: The Story Behind Every Track by Jean Michel Guesdon & Philippe Margotin (Black Dog & Leventhal), is available now. The music for Going to California originated during the sessions at Headley Grange, in a stroke of inspiration on Jimmy Page's part. "You didn't have anything like a snooker table or anything like that. No recreational pursuits at all. It was really good for discipline and getting on with the job. I suppose that's why a lot of these [songs] came at Headley Grange. For instance, Going to California and Battle Of Evermore came out." The four members of Led Zeppelin had been continuing their journey, which led them with this song to the shores of the Pacific. Just as Page's laid-back music is reminiscent of Californian folk rock, Plant's lyrics extol the West Coast spirit: flower power and the counterculture and creative excitement that were at their zenith in the sixties. It is a song dedicated to "the days when things were really nice and simple, and everything was far out all the time," to borrow words addressed to the crowd by Robert Plant at one of two concerts given by the band in Berkeley, California, in September 1971. Many years later, in 2002, Plant would provide a little more detail, telling Spin magazine that the song was "Me reflecting on the first years of the group, when I was only about... 20, and was struggling to find myself in the midst of all the craziness of California and the band and the groupies." The line "The Mountains and the canyons start to tremble and shake, the children of the sun begin to awake" alludes in all likelihood to the artistic community of Laurel Canyon, embodied in late sixties by Joni Mitchell, David Crosby, Graham Nash, Stephen Stills, Jackson Browne, and Jim Morrison. The first-person narrator has taken the decision to make a new start and to abandon "a woman unkind". The line "Someone told me there's a girl out there with love in her eyes and flowers in her hair" evokes Joni Mitchell, who, since leaving her native Canada, had occupied a place on the Californian avant-garde musical scene both as a musician and as a symbol of the counterculture. This reference in the form of a tribute is corroborated by the beginning of the fourth and last verse: "To find a queen without a king, they say she plays guitar, cries, and sings" is surely an allusion to I Had a King, the first song on Mitchell's debut album (Song to a Seagull, 1968). Both Plant and, above all, Page had fallen under the spell of the "lady of the canyon" at this time. "The main thing with Joni is that she's able to look at something that's happened to her, draw back and crystallise the whole situation, then write about it," notes Jimmy Page. "She brings tears to my eyes, what more can I say?" Going to California is the second track on the album - after The Battle of Evermore -with no contribution whatsoever from John Bonham. Indeed, this superb acoustic ballad is performed by strings (two guitars and a mandolin) and voice alone. It seems to have been recorded exclusively at Headley Grange, using the Rolling Stones Mobile Studio, with no overdubs added at Island Studios. "Going to California was a thing I'd written before on acoustic guitar," explains Jimmy Page. It was nevertheless in the tranquillity of southern England, in the old house in the middle of the countryside, that, with the help of John Paul Jones, he gave the song its shape during an evening in front of the fire. The track opens with Jimmy Page's acoustic guitar. He is playing (fingerpicking) his Harmony Sovereign H1260 in open-G tuning (D G D G B D). Before long, John Paul Jones joins him on his C. F. Martin A-style mandolin (stereo left). The mood is bucolic, pastoral, and very British. Robert Plant's lead vocal then begins, gently, tenderly. Plant's performance is delicate and intimate, an impression accentuated by the total absence of reverb. His special gift is to be as at home singing ballads as he is performing the most unbridled rock number. Coinciding with Plant's entry, Page adds a second part on his Harmony Sovereign (on the right), which combines finger-picking, licks, and chords. The harmonious blending of the three instruments is a real triumph, and in fact an instrumental version of the song can be found on the second CD of the deluxe edition of the album, giving a sense of just how well Page and Jones complement each other. In the middle section of the song (from 1:41), the tonality changes from major to minor, hooking the listener all the more effectively as Robert Plant now adopts a powerful, high-pitched voice enhanced by generous, deep reverb. He then resumes his more soothing tone in the following verse, this time coloured by light, short reverb. Finally, the outro ends with a fade-out, the instruments on the same D chord while Plant's reverb-drenched voice can be heard in the background (from 3:19). For the record, when Jimmy Page travelled to California with Andy Johns to mix the album at Sunset Sound, a substantial earthquake hit the region. "I remember lying in bed while it was shaking up and down," explains Page, laughing. "I immediately flashed on Going To California, where Robert sings, 'The mountains and canyons start to tremble and shake,' and all I could think was, bloody hell, I'm not taking any chances - I'm going to mix that one last. Which I did!" Andy Johns, meanwhile, showed a little more sangfroid: "I remember Jimmy saying: 'oh don't put that on there, it will cause another earthquake.' I said, 'oh, don't be so bloody stupid, gimme a break!'" Robert Plant in particular was fascinated by the Laurel Canyon musical scene, a fascination that was not exactly reciprocated. 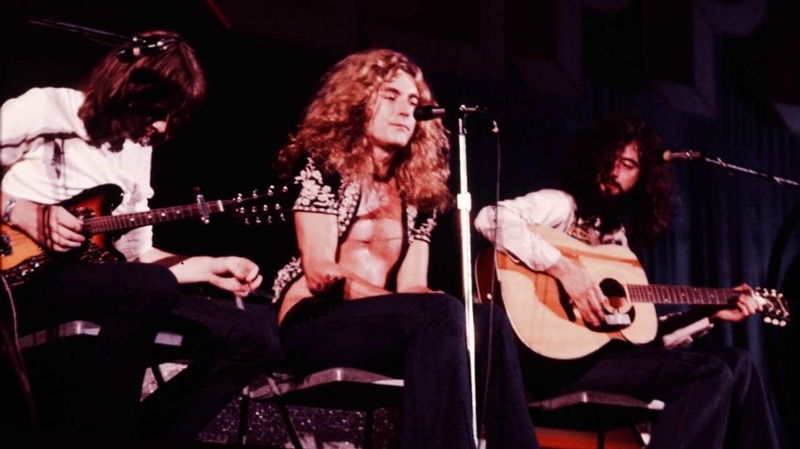 "The people who lived in Laurel Canyon avoided us," explains the Led Zeppelin singer. "They kept clear because we were in the tackiest part of the Sunset Strip with tacky people like Kim Fowley and the GTOs." At the very beginning of the track (0:01 precisely), someone can be heard taking a deep breath. This article has been viewed 1,996 times since being added on November 29, 2018.